During the 1930s several national institutions were begun which served to unify Canada. R.B. Bennett began the Bank of Canada, although it was changed from a private to a public institution by Mackenzie King. It could set rates and regulations for banking across the country and be an instrument of national financial policy. 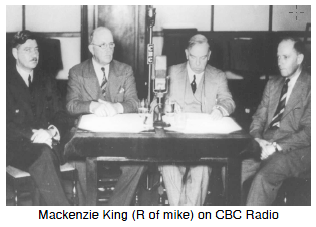 Bennett also started the Canadian Radio Broadcasting Commission, the CRBC. This would later become the CBC - a publicly funded national broadcasting network which talked to Canadians in distant corners of the country. The Canadian Wheat Board, which guaranteed farmers a minimum price for their wheat through a single desk marketing system, was introduced by Bennett in 1935. And Trans Canada Airlines, now Air Canada, gave us a national air transport company in 1937.